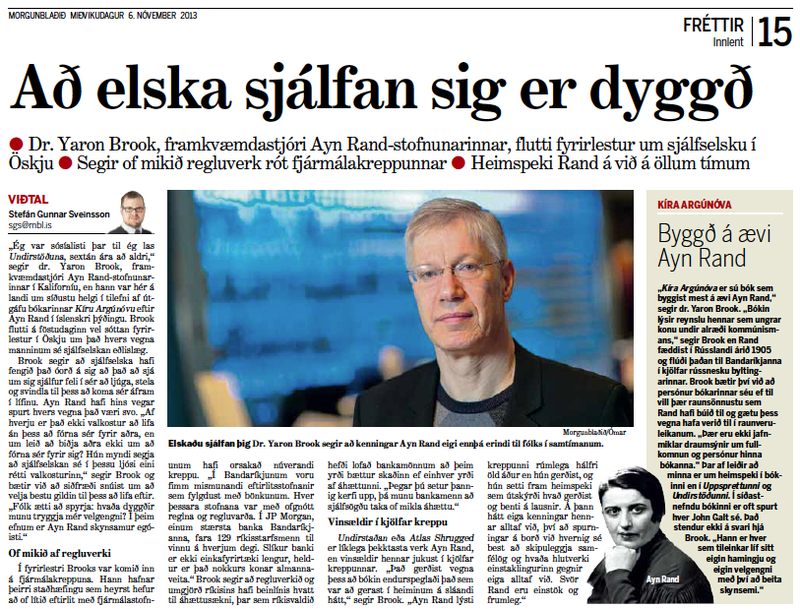 Dr. Yaron Brook, director of the Ayn Rand Institute in California, gave a paper on self-love and capitalism in Reykjavik 1 November 2013, on the occasion of the publication of the Icelandic edition of We the Living, the most autobiographical of Rand’s novels, called “Kira Argunova” in the translation. According to Brook, in her novels Rand described the independent, creative individual who was proud of herself and determined to fulfil her potential as a rational human being. The real opposites in life were the free and spontaneous development of free individuals under the law on one hand, and government coercion in the other hand. In Western philosophy, Aristotle came closest to Rand in this ideal or moral goal. Self-love in Rand did not mean aggression towards others. 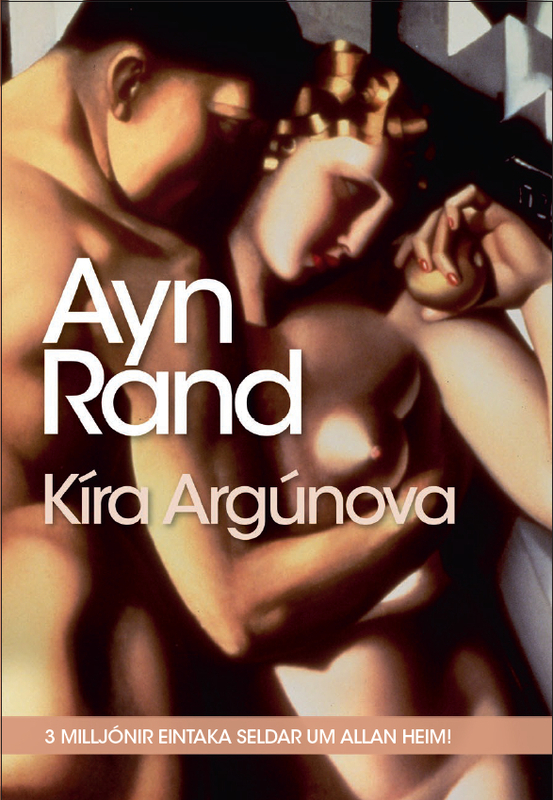 However, the proud and independent individual in Rand—often a woman, for example Kira Argunova in We the Living and Dagny Taggart in Atlas Shrugged—refused to sacrifice herself for others. She was working for herself, not for others. Capitalism was the economic order under which people could develop and flourish in all their diversity without violating the rights of others or having their own rights violated. 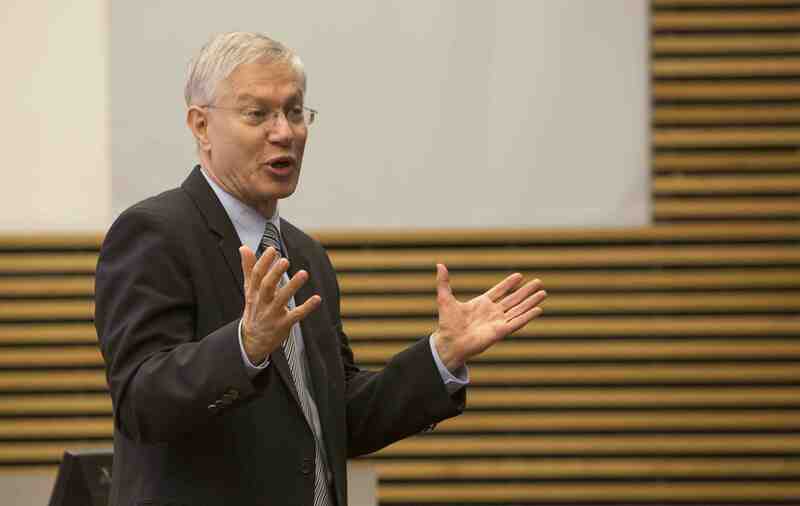 A lively debate followed Dr. Brook’s speech. He was asked about charity in a Randian world. He responded that people could help and love others, but that the recepients had to deserve it. The social ills that most people were concerned about, such as poverty, were not remedied by charity, but by production. Only a fraction of the population could not look after themselves, but in a free society sufficiently many would want to help them, and they could do so because of capitalism. Brook said that he had nothing against charity, at your own expense. Brook was also asked whether he did really equate whipping a slave’s back and regulating the financial market. His answer was that the essential distinction was between coercive and non-coercive actions. Individuals should take responsibility for their lives, and government should not relieve them of that responsibility. Professor Hannes H. Gissurarson who chaired the meeting observed that in Icelandic a distinction was made between two senses of pride, “dramb” on the one hand, one of the seven deadly sins in Christianity, and “stolt” which had a positive ring to it. 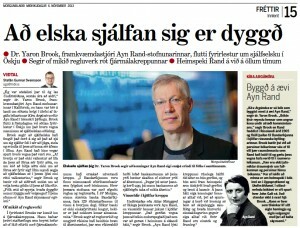 Rand’s ideal of the proud and independent individual was better captured by the latter of these two words, “stolt”.